Target Field Weather: Opening Day Forecast | That's Twins Baseball. A Minnesota Twins Blog. I’ve been getting a lot of hits on the site looking for what kind of weather to expect for the Twins opening day game against the Tigers. The simple answer is this: It’s not going to be nice baseball weather. To try to give you a high temperature at this time would be silly since it’s a week out. As a meteorologist I always get ripped for being wrong about the temperature or the weather when I forecast it THREE DAYS in advance, why would you trust me now? The truth is: it’s too far out to make an accurate prediction of what the weather will be at 3pm on Monday, April 1st. I’m sure you just love the responsible explanation of it being too far out to tell…”I want the truth!” Well I can’t handle the truth a week out but I will offer you some things to chew on. According to the Weather Channel, the average high is only 50 degrees on April 1st. Yes, I also am wondering why they would even consider having a team open up the season at home when the average high is only around 50 degrees. There also is a lot of snow left to be melted which will hold the temperatures down a little. One thing on Target Field’s side is the fact it’s in an urban area with a lot of concrete that warms nicely in the April sun. Same reason the snow melts off the roads so much faster in March. The fact that the game is played during the day might make it feel a little more bearable as our bodies and blankets sit in the sun. These are just a few things to think about that don’t involve a high temperature forecast. However, then there’s another forecast model…my gut or GUT model. This model is known for it’s negative bias. When there’s a foot of snow forecast, it predicts a couple inches. When severe thunderstorms are forecast, it expects light rain. The GUT model’s forecast for April 1st has a couple things factoring into it. 1) The Twins last two seasons being vomit inducing and thus why would the weather want to cooperate. 2) It’s been a cold March and now there’s going to be a brief warmup as we head towards opening day and the weather is going to pull a “That’s Twins Baseball” on us. The excitement of a new season (warmer weather) will be met with the reality of the new season (cold front comes through, pitching stinks) weather turns cooler and is a buzz kill. Just like the past two seasons…A fresh start met with pain. Again, this is simply the GUT model speaking and one of the equations used is the trends of the past two seasons and also Denny Green “They are who we thought they were”. Well there’s all that. Here’s what my forecast is a week in advance. Mostly based on a gut feeling so don’t take it as real science. I’ll update this as we get closer and give you a real forecast (using science). TTBB Forecast: 43 degrees and sunny. Bring dark colored clothing and blankets to absorb the sun’s rays better and keep you warm. Drink heavily (NOT CONDONING JUST SAYING) and don’t boo Mauer. 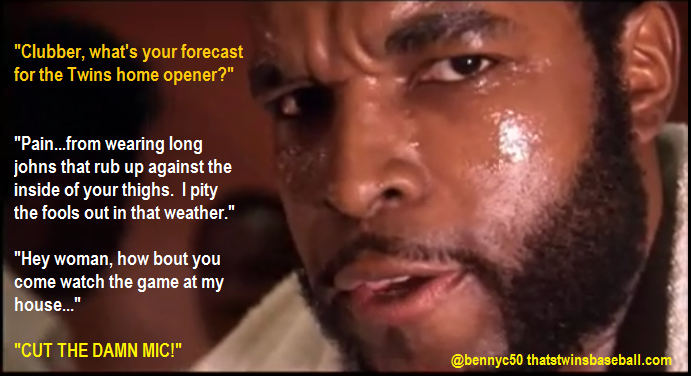 Oh and let’s go down to TTBB’s weekend meteorologist, Clubber Lang for his take…. I also recommend sitting or walking over to the 3B side of the park whenever possible – 1B is in the shad all afternoon this time of year. Very good point. Never thought of that.